The drawing on this eighth page of the sketchbook interests me, because I rarely draw in this sort of "chiaroscuro" manner. 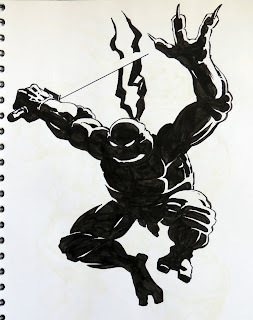 I admire people like Bernie Wrightson and Mike Mignola who can really pull it off. I think I got about eighty percent there with this one. It's a fun picture, anyway! WOW! This is one of the coolest sketches of Leo I've ever seen. I don't know how you did it/thought of it, but the fact that there's no line drawn for the blade. But you still see it, awesome! I was really happy to see new activity on your blog. And, obviously, these sketch book pages are a lot of fun to see. Nice artwork and interesting designs/ideas (obviously). I was wondering if these concepts would have been for the same project as the concept art Kevin Eastman revealed about a year ago? With Kirby the fifth turtle, Evil April and a villain called Spyder? I really would've liked to have seen either a movie or a comic book with these ideas. And having the two work together would be neat.